Jersey Royal new potatoes are prized for their flavour. 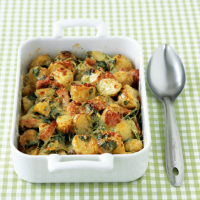 Try this one-pan supper dish, which is delicious served with warm bread and salad. Place the bacon in a large, non-stick frying pan and cook over a medium heat for 3-4 minutes, stirring occasionally until browned. Add the crème fraîche to the pan, then stir in the stock and add the garlic. Bring to the boil. Add the potatoes, bring to a simmer then cover and cook for 20-25 minutes, until the potatoes are tender when pierced with the tip of a sharp knife. Remove the lid and cook for a further 5 minutes, stirring occasionally to reduce the liquid slightly. Season with freshly ground black pepper. Remove from the heat and stir in the watercress. Pour into a warmed 1.5-litre ovenproof dish (or use the frying pan if the handle is heatproof) and top with the cheese. Place under a preheated hot grill and cook for 3-4 minutes or until golden. Serve with more watercress, some cucumber strips dressed with a little balsamic vinegar or fresh lemon juice, and some warmed bread to mop up the sauce. This dish can be made a day ahead up to the end of Step 2. Cover and chill until required. Gently reheat in the pan until piping hot then continue from Step 3.